This poster is different than the rest! 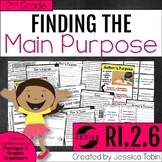 In the second grade common core standard RI.2.6, students must identify the main purpose of the text, including what the author wants to ANSWER, EXPLAIN, or DESCRIBE. 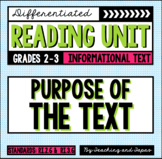 These are different purposes than in the past and in other grade levels. 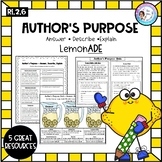 I made this cute "D.
This graphic organizer is aligned with Common Core Standard RI2.6 where our students need to answer, explain, or describe the author's main purpose of the informational text. 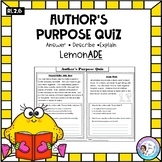 Author's Purpose Passages RI2.6Includes:8 Passages2 Flipbooks (Desrcibe, Explain, Answer) (Persuade, Inform, Entertain)Standard: RI.2.6-Identify the main purpose of a text, including what the author wants to answer, explain, or describe. 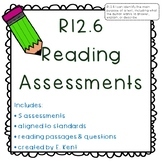 This assessment is aligned to reading informational Common Core Standard Ri2.6 that assists students in identifying the main purpose of the text and explaining what the author asks, explains, or describes about an idea. 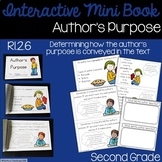 This graphic organizer is used during guided reading. 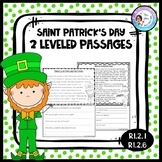 The students respond based on their text that week.